I think it's about time for me to do this. 1. Tell you something I learned about you by looking at your page for 10 seconds. 2. Tell you a color you remind me of. 3. Tell you what element I believe you belong to (water, fire, air, etc.). 4. Tell you what OC(s) of yours is/are my favorite(s). 5. Ask you a question, and you must answer. 6. Tell you something I like about you. 7. Give you a nickname. 8. Tell you what am I doing right now. 9. Tell you what food/flavor/smell you remind me of. 10. Dare you to do one of these in your journal too, if you haven't already. Here to make art and meet new people! 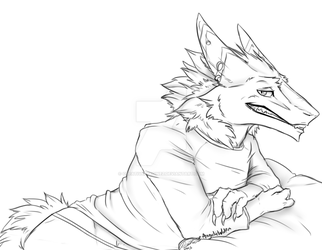 Reign-The-Sergal has started a donation pool! Feel free to donate if you want. Thank you. Thanks for the watch. :3 I take it you are a fellow Sergal fan? Howdy! Just dropping by to say what great doodles you have in your gallery! Keep it up! Thanks a ton for the watch!